To save image, right click on your mouse, choose "save image as..."
NOTES: This map is part of the Brian Mitchell townland map project and was in two parts when I originally scanned it. There are differences in the listed townlands from the 1851 Townland Index (found on SeanRuad.com). The blue area was not named and could be water. 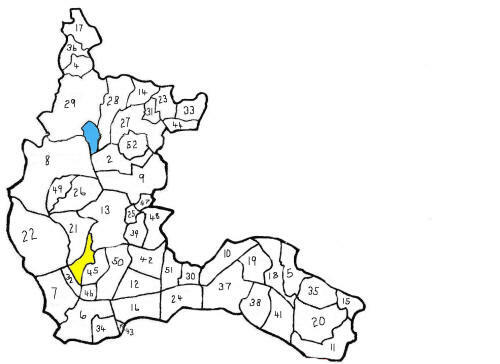 The yellow area was labeled Cartronsheela which according to the 1851 Townland Index, is found in Aughrim Civil Parish. The following townlands were not found: Ardos, Ballintober, Newcastle. However, checking the tithes you will find both Ardos and Newcastle listed in Aughrim Civil Parish, so they might have been on the border.